For years we've seen all sorts of microcontroller-friendly WiFi modules but none of them were really up to par. Either they were too slow, or too difficult to use, or required signing an NDA, or had limited functionality, or too expensive, or too large. This little silver module is carefully wrapped into an Arduino shield. 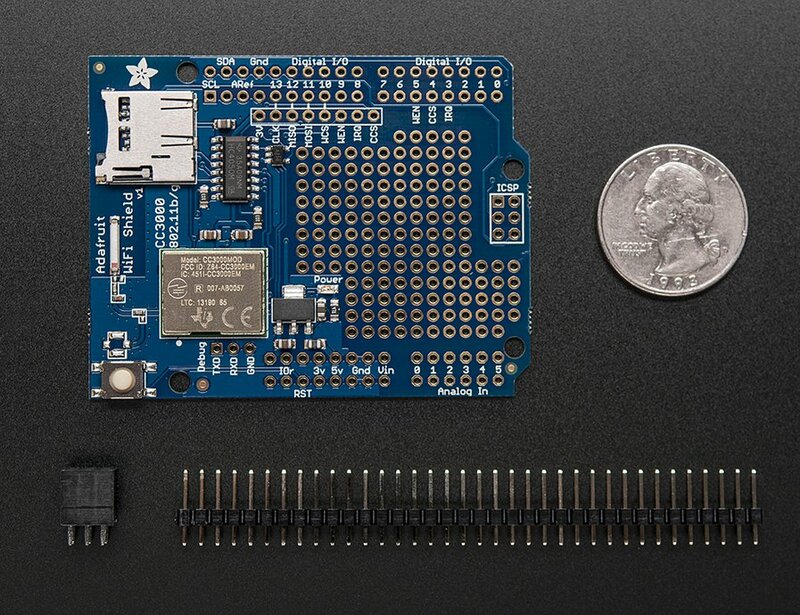 There is also a microSD socket and a reset button. 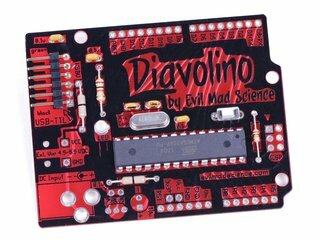 It has an onboard 3.3V regulator that can handle the 350mA peak current, and a level shifter to allow 3 or 5V logic level. 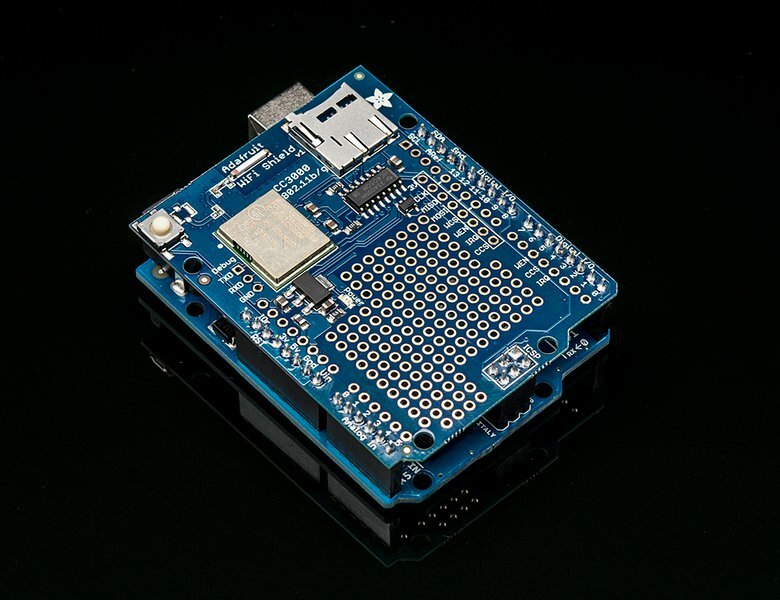 The antenna layout is identical to TI's suggested layout and uses the same components, trace arrangement, and antenna so the board maintains its FCC emitter compliance (you'll still need to perform FCC validation for a finished product, but the WiFi part is taken care of). Even though it's got an onboard antenna we were pretty surprised at the range, as good as a smartphone's. 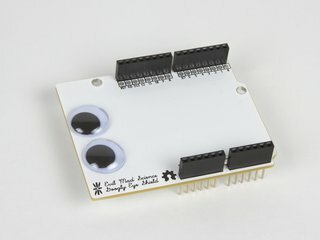 Each order comes with one fully assembled and tested shield, some male header for attaching it to an Arduino and a 2x3 female header that you can use to plug it into the ICSP port of a Mega. 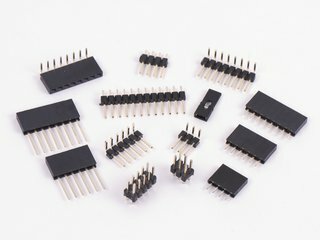 To get you started, there is a fully working Arduino library that is based off of TI's codebase but adapted for use with the AVR. There is also example code showing how to scan the SSID's, connect to your access point and run DHCP, do a DNS lookup to IP address, ping a site and connect to a remote TCP socket such as a website and print out the page. Please note the hardware is good, but the library code does not yet support all of the CC3000's functionality. SSID scanning, connection, DHCP, DNS lookup, ping, and UDP/TCP client connections (eg connect to a website and grab data) all work and are tested with example code. UDP/TCP server connections are not supported yet! 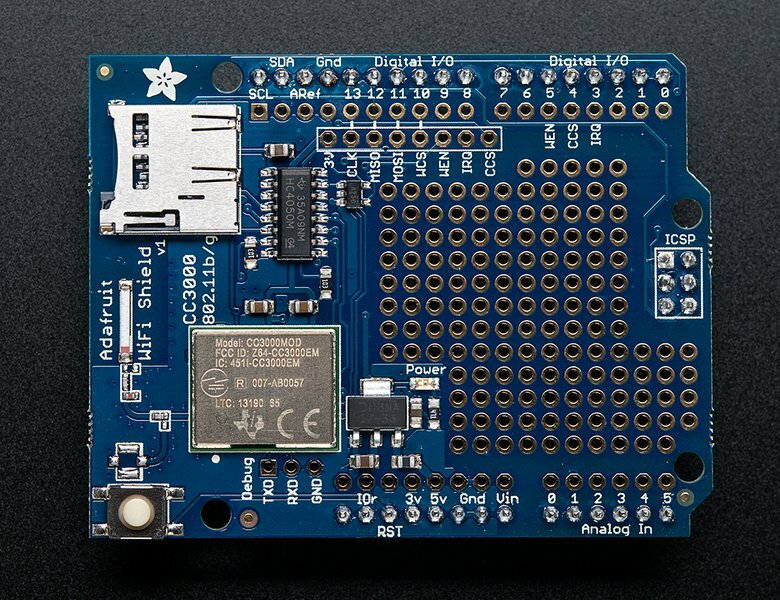 Check out the Adafruit tutorial for wiring and Arduino library downloads. 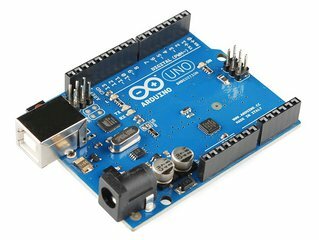 For use with Arduino Uno & Mega only at this time.